This talk gives you a lot to take away. 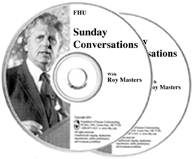 When helping people, Roy Masters uses his gift is to go below the surface; truths are revealed that become revelations. This Sunday is no exception. You will see the effect of the truth on the audience and maybe on yourself. Roy shares something about Jesus that for many has been a secret. What could it be about a fig tree, that died 2000 years ago, that could help you now? This talk could be “the beginning of redemption” or the beginning of something else.